About 10-minute drive from Yugawara Station, here at “Okuyugawara Yui –YUI-“ which is located deep inside the Yugawara Hotspring, you can spend a luxurious time listening to the voice of nature such as flows of clear streams and chirpings of small birds. How about retreating yourself to a hidden place where you can heal both your mind and body, and forget about the busy days? Have an elegant time here in these rooms where you can feel the refined harmony. 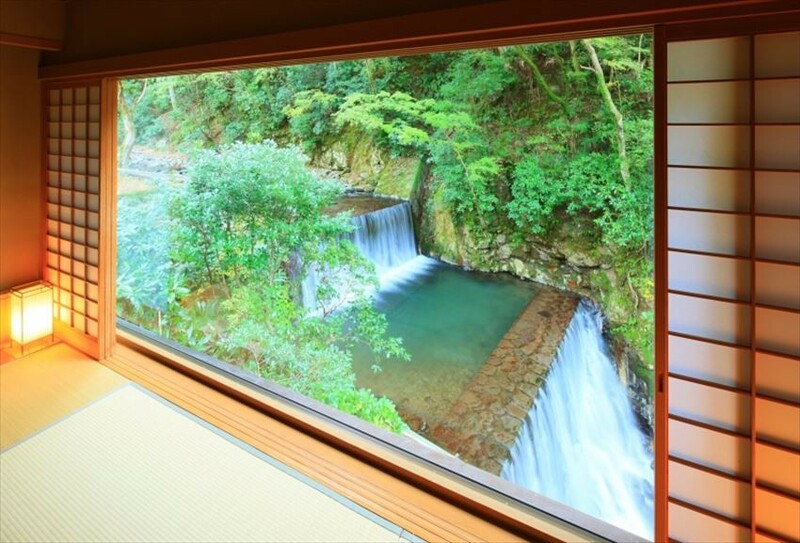 There are 5 types of rooms available, the “Sen”, “Rai”, “Roku” and “On” where you can see the clear streams and waterfall, and “Hou” which is recommended for family. 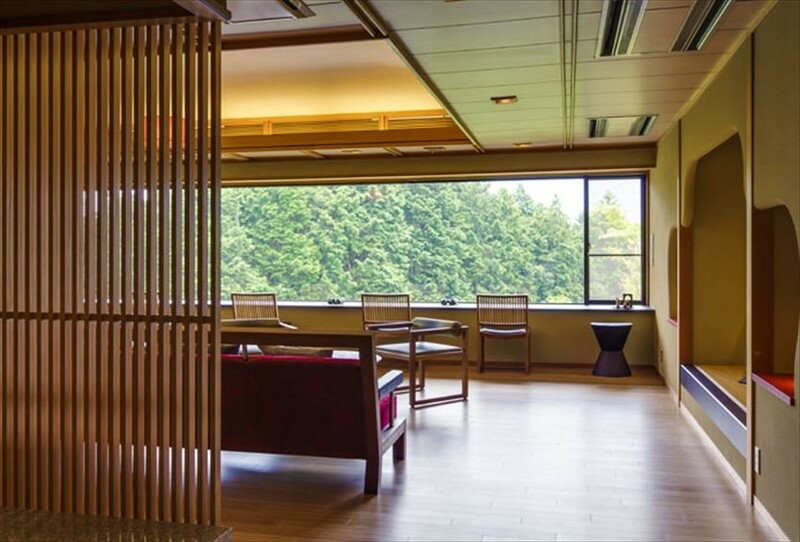 At “Sen”, “Rai”, “Roku” and “On”, one can enjoy the nature of Yugawara from the large floor to ceiling window in the Japanese-style rooms. While at “Hou”, a private garden is attached to the Japanese-Western style room, and you can see the beautiful flora such as cherry blossoms and hydrangeas up close. There is an inner bath where water is drawn from hot spring in the room and you can enjoy a luxurious bath time while watching the view of the garden. Apart from the inner bath, the large public bath as well as the open-air bath are worth a try too. The hot spring has an open structure with trees spreading in front, and the water which is directly flowing from the hot spring source gives a very soft feel. 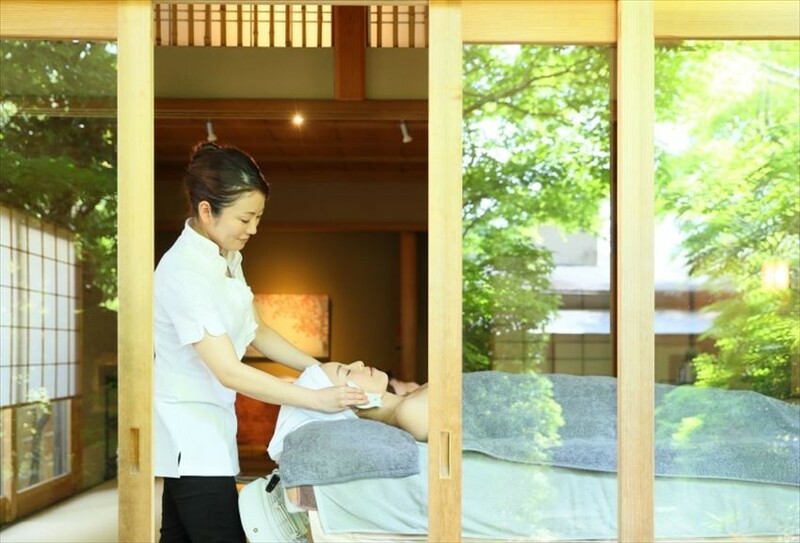 While enjoying the wind of Yugawara, stretch your arms and legs and slowly relax yourself. After the hot spring, visit “Shinmyoan” for the finest experience. A massage including Gua Sha and treatment is the best reward to yourself. Heal your mind and body from the fatigue and enjoy the extraordinary moment. For dinner, enjoy their original dishes at the “Dining Utakata”. 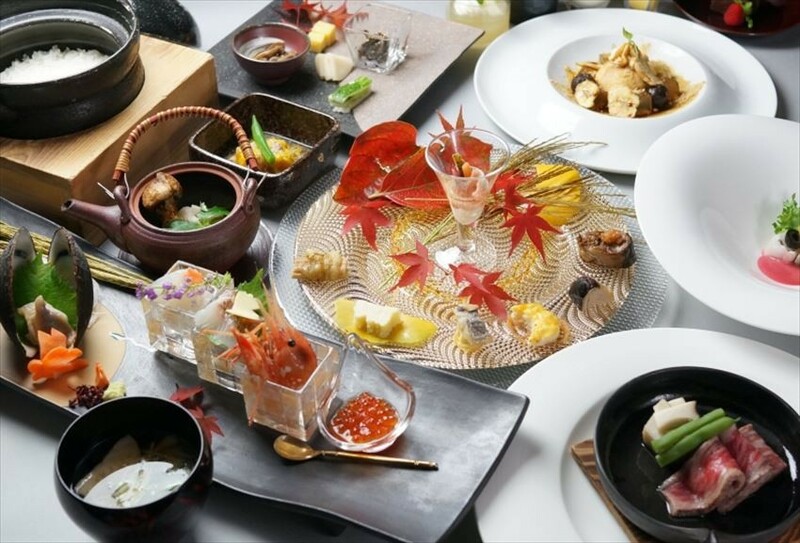 The food which uses seasonal ingredients such as seafood from Suruga Bay and Sagami Bay are exquisite. The dining place is lighted up at night and create a fantastic atmosphere. It will be one of those moments for your memories of the trip. 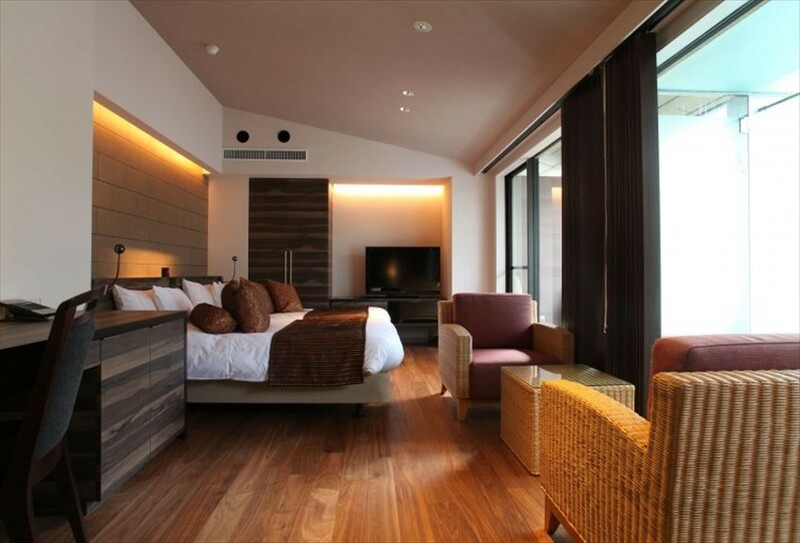 “Kitanokaze-saryou” which is located at Hakone Sengokuhara Hot Spring is a special hotel with a Hokkaido feeling in Kanagawa. Firstly, the guests are welcomed with a chic and relaxing lounge. 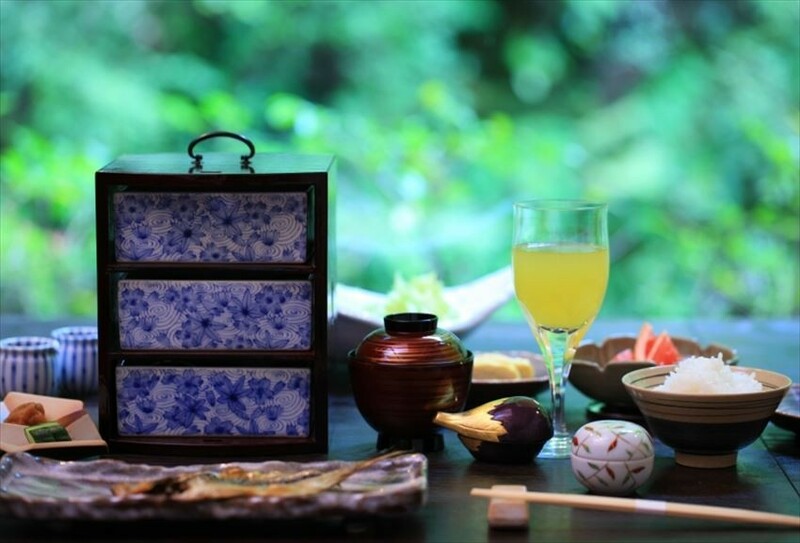 While enjoying the “Kintoki Kanoko” made by Hakone’s long established Japanese confection ship, heal yourself from the fatigue of your journey. Inside the hotel is a modern and harmonized Japanese and western atmosphere. The moment you step inside, you are welcomed into the extraordinary life. There are in total 10 special rooms available, for instance, the maisonette type “Nanakamado & Rairakku” with a private open-air bath at the basement, “Suzuran & Hanamasu” where you can have a bath while enjoying the view of bamboo grove, “Mizubashou” which is a special room equipped with sauna, etc. All rooms come with an open-air bath or fine view bath, you can give yourself a relaxing time without being concerned about other people. Furthermore, if you want to enjoy other hot springs, the chartered open-air bath “Komorebi” is highly recommended. 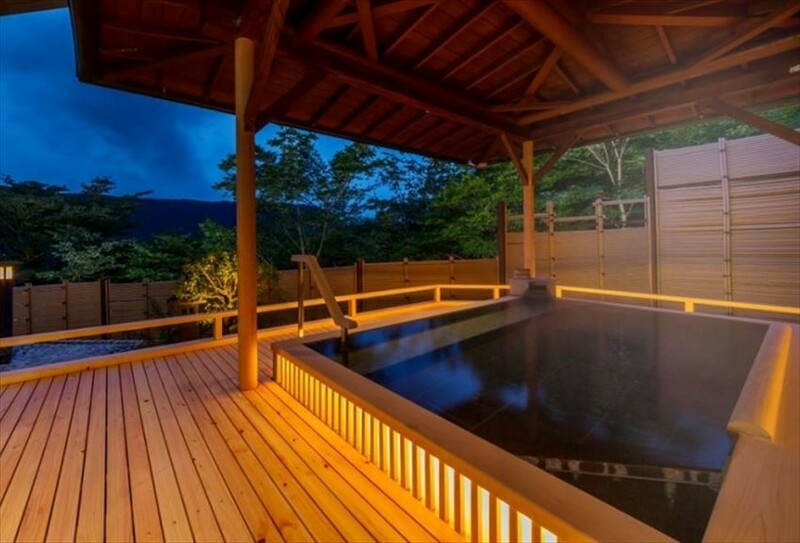 You can have the Owakudani hot spring to yourself in the silent night sky. Use it in conjunction with the bath in your room. For meals, you can slowly enjoy the Japanese-Modern menu which utilize fresh ingredients from Hokkaido and Hakone in the private dining place. Enjoy the exquisite flavors which satisfy not only the taste, but all five senses including sight and touch. The menu for breakfast is a menu centered on Japanese cuisine such as salads using vegetables from their own gardens and mackerel from Hokkaido. The deliciousness thrills through your body and you just cannot wait to wake up in the morning. “Washitei Hogetsu”, located at the best location where one can overlook Lake Ashiniko, is a healing hotel where you can feel the charm of the moon. 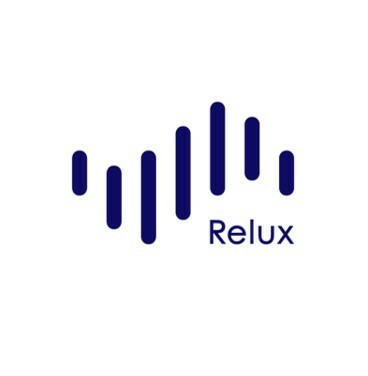 Don't worry about time and just relax in its slow flow. One can see many furnishings with motif of moon, including the tableware and tables. Items with motif of rabbit that is said to live on the moon are also being decorated. The very first thing to be introduced after your arrival here is the lobby lounge that faces the majestic Lake Ashinoko. You can enjoy the welcome tea in the modern atmosphere and unravel your tired body. 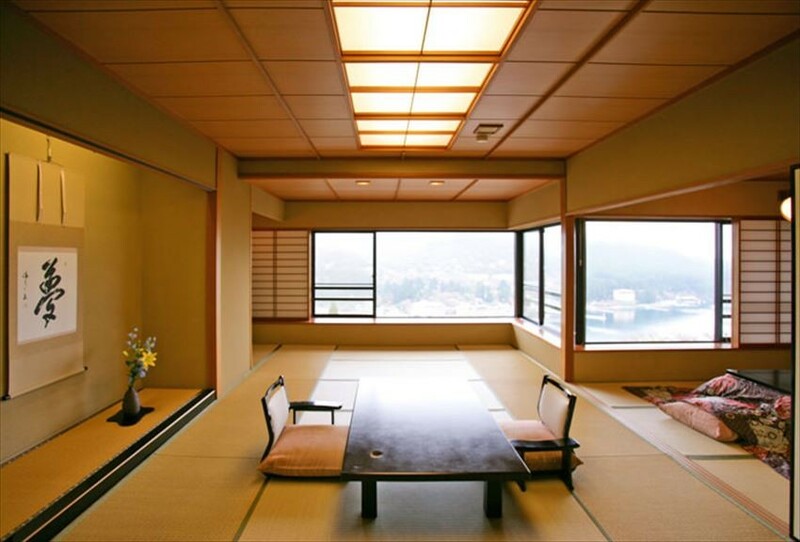 There are 2 types of rooms available: the “Ashinoko Block” with its wonderful location of Lake Ashinoko and the “Tsukimi Block” attached with “Tsukimidai (a place to view the moon)”. Named after the moon, there are plenty of space for relaxing. From Ashinoko Block, one not only can see the boats crossing the lake as well as the dusk with a fantastic atmosphere, and if you are lucky, you can even see the seas of clouds as if you are on the clouds. On the other hand, the Tsukimi Block is a special place with 2 rooms where you can see the moon over the Mount Futagoyama from the Tsukimidai. What about slowly looking at the moon while letting yourself to go with the flow of time? There are 2 types of inner baths: “Yukemori-no-Tsuki” with a view of outside from the bath made from stone, and the “Tsukimi-no-Yu” with wall covered by Hinoki. 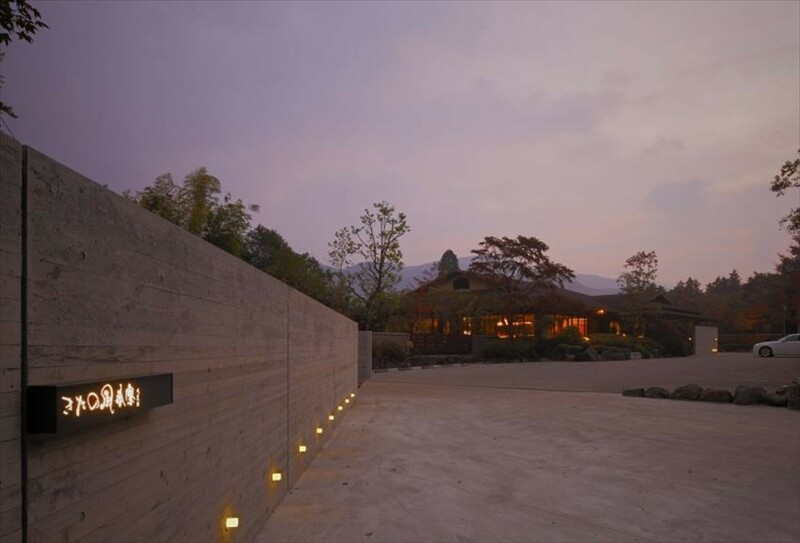 Whereas for the open-air baths, 2 baths are available: “Deaitsuki~Tomoshibi~” as if it is surrounded by light, and the profound stone-built “Fugetsu-no-Yu”. If you would like to have a private time, then the chartered open-air bath is also recommended. 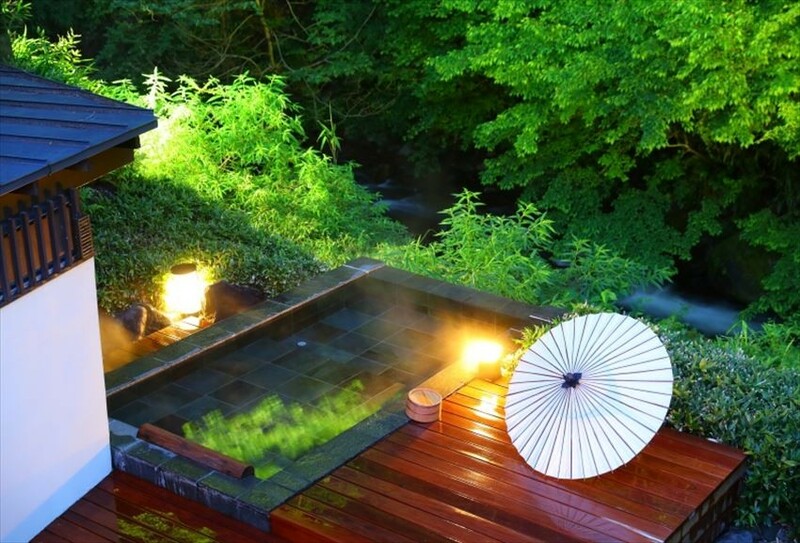 The 2 chartered open-air baths “Tsuki (Moon)” and “Hoshi (Star)” are private spaces with modern atmosphere. Without the need to be concerned about the surroundings, it helps wash away the fatigue of not only body, but also your mind. 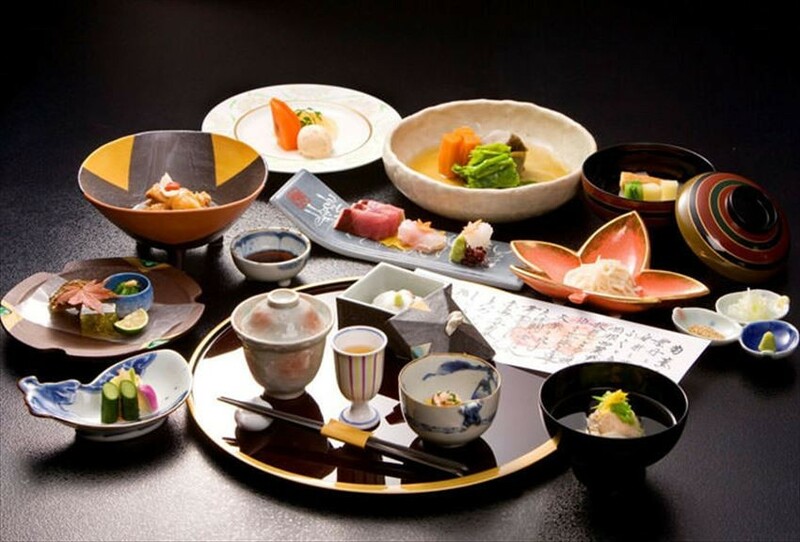 For meals, you can enjoy the modern Kaiseki which uses fresh seafood and food of the mountains from Hakone. With their belief of not having a specialty menu, one can look forward to their seasonal dishes which change monthly. Please enjoy their extreme menu which is not fixed in one form such as Japanese, French, ethnic, etc. For breakfast, you can enjoy from the morning healthy menu which uses fresh vegetables from the local. You can also change your breakfast to western style with bread and salad, etc. by making a reservation in advance. It is convenient for those who want to eat bread for their breakfast. The dining place is a private “hori-kodatsu (low table over a hole in the floor) space, so you can have your moment without disturbed by others. You can enjoy the delicious food in a space with gentle sunlight and breeze.